1330 E. Valley Parkway exterior, "just behind IHOP." Don’t look now but Escondido’s venerable Philosophical Library dating back to 1963 is nowhere to be found. It’s last Facebook page post was in October 2016 with a link to a GoFundMe page that had raised $238 — of a $20,000 goal — as of Friday, March 10, 2017. Don’t look now but Escondido’s venerable Philosophical Library dating back to 1963 is nowhere to be found. It’s last Facebook page post was in October 2016 with a link to a GoFundMe page that has raised $238 of its $20,000 goal as of Friday, March10, 2017. A reflection of the times, a sign of the future that this non-profit, all-volunteer 12,000-plus book and media lending library and book sanctuary established in 1963 needs sanctuary? That all those books now sit, unaccessible and non-circulating, at a nondescript local storage unit? Perhaps. Then again, bad economic fortune may strike anywhere at any time. A funny thing happened on the way to 1330 East Valley Parkway (behind IHOP), the non-profit library’s once and now distant home. it got served. More than a tad frustrating, Philosophical Library members say. After all, for more than a half century the place was a local institution, honored and well trafficked, providing space for classes and meetings as well as gift and book sales, jewelry, gem stones and crystals. What’s Escondido going to do? 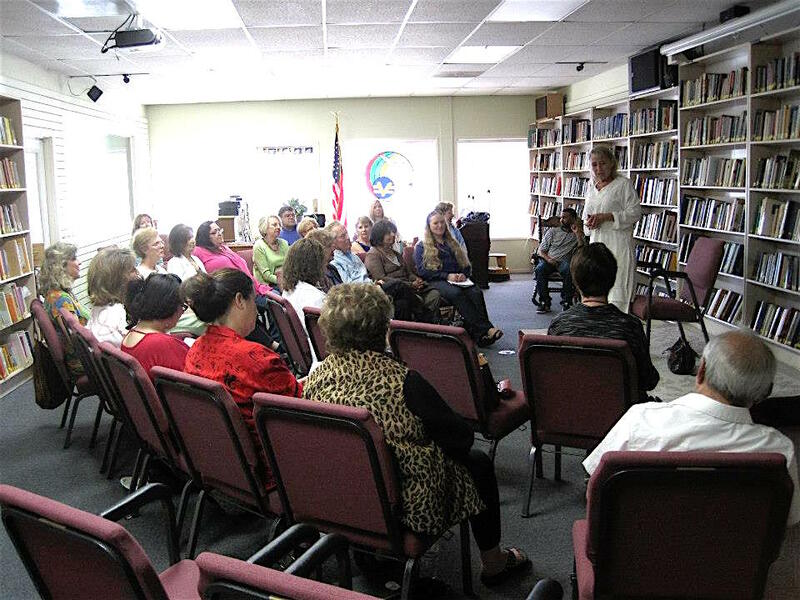 Lecture at the Philosophical Library in better times, 2013. 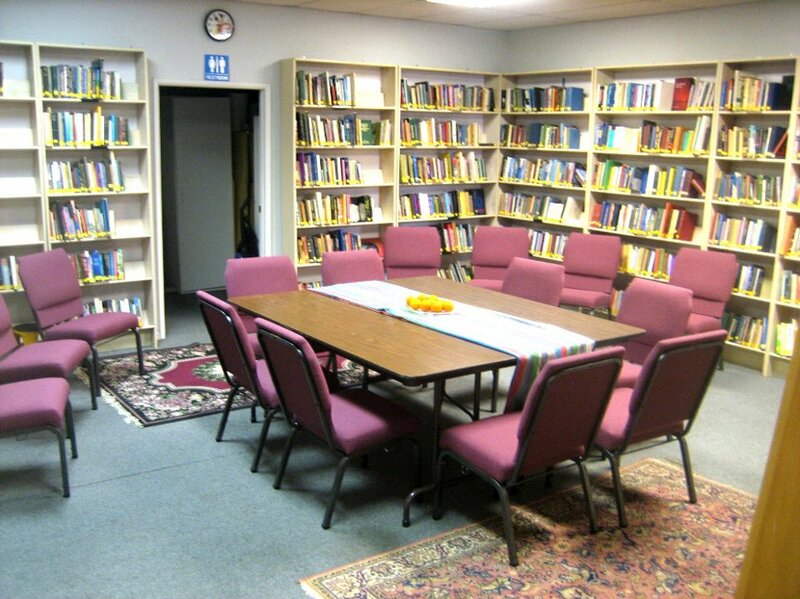 The Library has had to move on more than one occasion, so probably members know the drill. It began on Rose Avenue, then moved to Felicita Boulevard and Centre City Parkway. Going all willie Nelson, the ‘brary hit the road for Grand Avenue and Broadway. After that, the library relocated to 507 S. Escondido Boulevard, the group moved headquarters in 2007 to 2091 East Valley Parkway, Suite D. The reason for that move? The building it was leasing changed ownership. Lady Ashtar (Terrie Symons) channeling a message from Ashtar during the Library’s salad days. Alas, that move lasted all of four years. 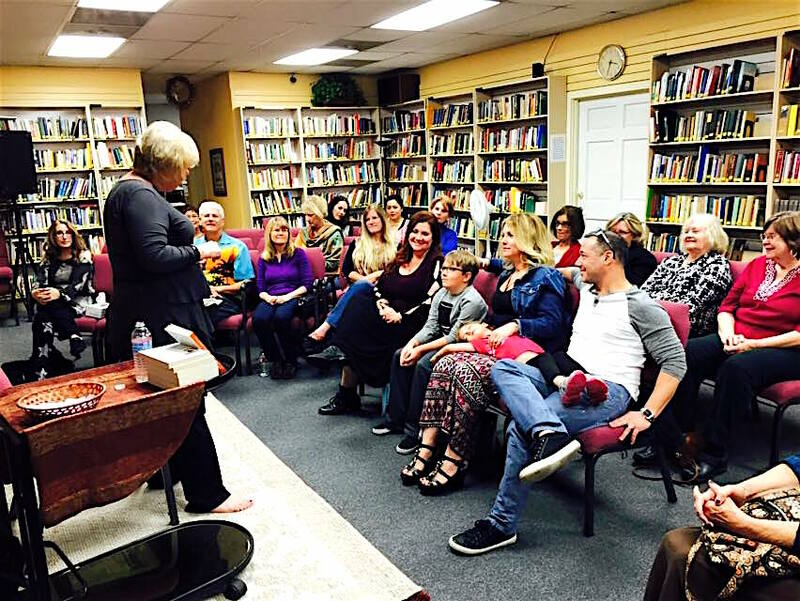 Yet again, the verisimilitudes of fortune, mainly poor, necessitated another downsizing move, this time to 1330 East Valley Parkway., “behind the iHop).” The library settled in to space shared with Creative Center for Spiritual Living, “so roomy and comfortable — very inviting,” seekers said, in February 2011. The library was established in under the name The Philosophical and Religious-Free Library by its founder, Stuart Otto. At that time, the library was to serve as a place for the collection and preservation of texts and criticisms of all religions known to man. Alas, nothing lasts forever, or even the equivalent of one U.S. presidential term, for what is believed to be one of the oldest continuing operating metaphysical bookstores in the nation. At its high point, the library has 400 dues paying members. That’s down to 100 or less. On the other hand, the library had 8,000 books when it moved in 1022. It has those 12,000 volumes today. Ron Porter waved eloquent about the library a few years ago. “The guiding principles of the Library were very unique and, although guaranteed by our country’s Constitution, promoting ideas embraced by other than the main stream vocal majority and providing the materials for research of such subjects was just beginning to emerge in the early ’60s,” Porter said. “AT&T had just released the touch-tone phone, the Beatles released their Number One hit ‘I Want To Hold Your Hand,’ and Dr. Martin Luther King attempted to release a country from turmoil with his ‘I Have A Dream’ speech,” Porter said. “In that year the Philosophical Library’s mission was set as follows: Not supporting or identifying with any one specific teaching, doctrine, or creed in exclusion of others – and to be an open place for the pursuit of wisdom. No avenue will be left unturned, therefore, as members look for a way, they have the will, to find a new home somehow, somewhere in the greater Escondido area. Got any clues? Contact Magana at (760) 822-6294 or info@PhilosphicalLibrary.ord. The group maintains a website at http://philosophicallibrary.org/.